Retail is transforming. With digital commerce, the role of bricks and mortar stores needs to shift from transactional to experiential. In her presentation, Fiona shared key insights, case studies, and the learnings that came with these studies. Simply put, brands need to think beyond transactional metrics to an experiential driven approach to gain the most insight. Brick and mortar retail needs to become a key brand building touchpoint. By applying these Experience Driven Marketing principles to your research strategy, you will generate a positive impact on your reach. In Fiona’s presentation, she explains the key ingredients that one needs to create an outstanding retail experience, from measuring in context of traditional and emerging media, to the value of emotional response. Discover this new technology-driven, real-time approach to evaluating the return on retail investment. 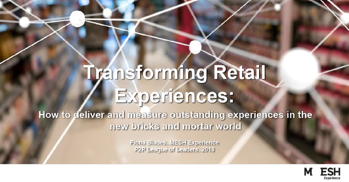 Download the Transforming Retail Experiences presentation for FREE to learn more about how to deliver and measure outstanding experiences in the new bricks and mortar world.